This is the final post in a three-part series. Part one was an introduction to selling learning content to individuals and organizations. Part two examined the most important learning management system requirements to support the sale of training. Part three will show how Absorb LMS meets the needs of commercial course providers. I’m writing this post on a flight to Seattle where Mike Owens, co-founder of Blatant Media, and I will be meeting with the great team at Adobe to help them plan out their learning management system (LMS) strategy. It’s been 12 years since I was last in Seattle. During my last trip there, I attended a conference on the design and development of help systems for software applications. Basic usability: Each feature is an island onto itself. You use a feature to perform a task and the application returns you to the home screen where you can then use a different feature. If you’re lucky, the interface design will be clean and uncluttered, and the features will be easy to find and use. Workflow enabled usability: After performing a task, the application provides you with logical choices for what you may want to do next. In other words, the LMS is designed with workflow in mind. 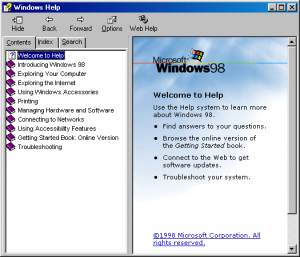 Older readers may recognize the following as Microsoft’s early implementation of this idea. Usability through automation: The application contains the ability to automate common tasks so that they do not need to be manually repeated. This is the highest level of usability, where the application does your work for you. Automation is the holy grail of usability. Automation frees the user from their natural physical limitations. Automation should be a top priority for anyone starting a business. Enrollment keys: When a customer comes to you and says they want 300 learners to take one of your courses, you can send that customer an e-mail from within Absorb that contains a special code called an enrollment key. The customer distributes this code to his or her employees who, in turn, paste it into a registration page. Once registered in the LMS using the enrollment key, learners can be automatically defined as a group and enrolled into a course or curriculum. 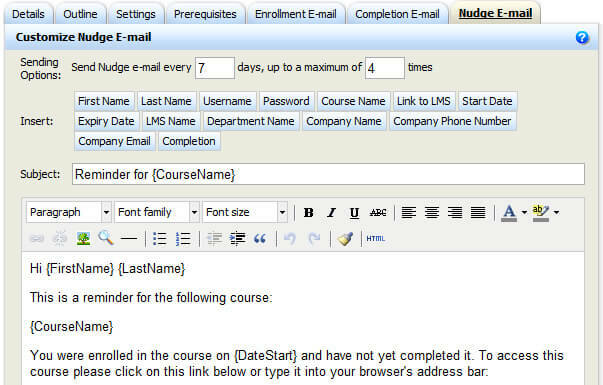 Email automation: Each course can have its own templates for enrollment, reminder or “nudge,” and completion emails. (If you want to really bug a learner, set the frequency of the nudge e-mail to daily.) 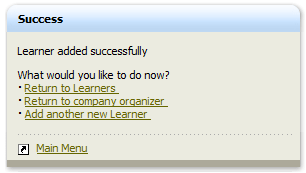 These e-mails are automatically sent to learners when appropriate. Report automation: There’s no need for an administrator to log into the system to view a report (although they can if they want to). 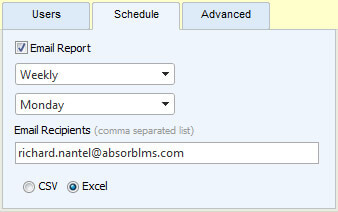 Reports in Excel or comma delimited format can be set up to be automatically e-mailed to one or more individuals daily, weekly, monthly, or quarterly. The client who sent you 300 learners probably wants to know the progress of his or her learners. Make this customer a recipient of a weekly learner progress report and they’ll be thrilled to be kept informed. . Certificate management: Certificates are automatically issued to learners upon completion of their training. If applicable, learners will be automatically notified that they need to re-certify at a later date. If the content required to re-certify is different from the original content, the system will automatically enroll the learner into the correct course or curriculum using a feature called the Post Enrollment Trigger. As a commercial training provider, focus your effort on growing your business, creating fantastic content, and providing a rich learning experience for your users. Don’t get sucked into the quagmire of manually administering and tracking the experience of your learners one by one.